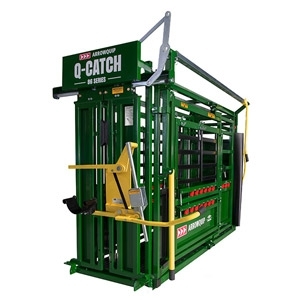 The Q-Catch 86 Series chute is designed for easy access, ease of use, and offers ultimate safety to both rancher and cattle. This exclusive, high-quality squeeze chute is widely recognized as the best manual squeeze chute on the market today! By taking the manual work out of the manual squeeze chute, our Q-Catch 86 Series chute has revolutionized the way ranchers think about cattle handling, and is redefining the meaning of silence in cattle handling operations.